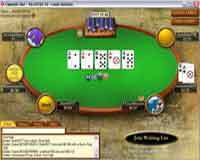 The Poker Stars software package is the most popular downloaded software platform in the world. The site itself is the largest online poker site featuring an enormous variety of cash games and tournaments on offer. The tournaments, in particular, are very well known at this site and many players consider them to be the standard that other sites should aim to come up to. A team of professional players sporting some very well known names adds to the glitz of this site. 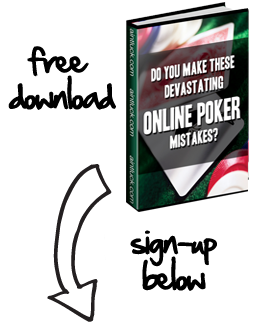 Whether you are a novice player or a poker master, PokerStars is definitely the online poker room for you. 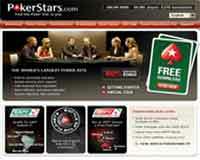 In order to download PokerStars, the first thing you will need to do is visit the PokerStars.com website. You can do this by clicking on either arrow above. Once you are at the website, you need to click on the ‘Play Poker’ button. This will initiate the automated download process and get your started. 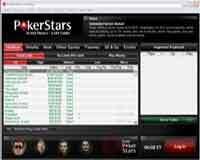 Once you have finished downloading the Poker Stars software package onto your hard-drive, you will then need to install it onto your computer. The stars software is compatible with both Windows and Mac computers. After you click on the installation program that was saved to your computer, you will have to choose your language. Poker Stars currently offers their software in 19 languages. After you choose your language click ‘Next’ and the software will start to install. This process should take less than a minute. Once the software has officially been installed onto your computer, it will launch automatically. At this point, you will need to set up your account information. Click on the ‘Create New Account’ button, and you will be walked through step by step through the account creating page. Here you will put in your name, address, and be able to choose your User ID. After you have created your new account, PokerStars.com will send you a confirmation email. Click on the link in the email and you should be set to start playing! At any poker site, the easiest and most effective ways to attract players is to make the playing experience a most rewarding one. At PokerStars, the bonus offers alone make playing at this site a most appealing prospect. An amazing $600 first deposit bonus leaves no doubt that this site has a generous bonus policy.Make your first deposit with a special code and get a 100% bonus right up to $600 right away. Players can make three qualifying deposits within 90 days to avail of the full 100% up to $600 bonus. While the generous first time deposit bonus ensures that new players are happy to sign up here, Poker Stars also keeps old timers happy with its attractive VIP and rewards programs. Different rewards programs are launched onsite from time to time. On offer at present are the FPP program, ‘Battle of the Planets’ Sit and Go tournaments, Daniel’s room etc. The site also offers reload bonuses periodically and information about these is sent to regulars through emails as well as displayed onsite. To become a VIP player and earn the special rewards for these exclusive members, a new player only has to play at least one real money poker hand. The more you play, the higher you go in terms of VIP Club levels. The Poker Stars software can best be described as ‘iconic’. Simple, user friendly and very easy on the eyes too, the software is a real pleasure to use for both newbies and old timers. The downloadable software package makes a point to bring in new game and special features at regular intervals and the software lends itself to these upgrades without any trouble. In fact, the downloadable client has a special page that tells you exactly what upgrades and changes have been made to the software so that you can make the most use of the new features/ additions. A look at this page with its listing of historic upgrades will tell you that this poker room is committed to revising the software regularly. There are several aspects that make this download software a truly user friendly one that gives players the best playing experience. The personalization feature is one of the most appealing aspects. Players simply love the fact that they can quickly download and install one of the many ‘themes’ offered onsite. The option to add your own photograph as your avatar is just one of the many special touches that make PokerStars.com so well liked. Some of the general features of the software include an amazingly detailed filtering system that allows players to pinpoint and list specific types of games and gaming aspects easily and quickly. To look back at a hand just played, the player can hit replay and revisit a fully animated replay- a very useful feature for those looking to improve their game. Searching and tracking multiple players simultaneously allows players to quickly locate friends onsite. One of the greatest advantages of playing at an immensely popular site like PokerStars is that new third party poker software is usually designed to be compliant with this site’s software. Players can use the latest versions of PokerACE HUD, Poker Tracker and other software without any trouble. All of the popular poker versions and some obscure variations give poker players an excellent variety of games to chose from here. You will find all version of Texas Hold’em, Omaha and Seven-Card Stud and also H.O.R.S.E., 2-7 Triple Draw, Five-Card Draw, 2-7 Single Draw Lowball, 8-Game, Badugi, Mixed Hold’em, Razz and Mixed Omaha Hi/Lo. Since the site has a policy of constant review and revision, there is sure to be a new set of games for you to try at periodic intervals. PokerStars.com is the home of some of the best and most exciting tournaments in the world of online poker playing. This site claims to have more tourneys than any other site in the world. The best part about these is that the tournaments are offered over a large variety of games and at different buy- in levels. This makes them accessible to a huge section of the site’s player base. The biggest online poker tourney series in the world, the World Championship of Online Poker is hosted by this site annually. In addition, you will also be able to try your hand at the Spring Championship and Turbo Championship. Suffice to say, there is a tournament starting every second at PokerStars.net which means that you can simply step in and start playing practically at any time. A wide variety of tourneys are held here including Sit&Gos, Multi tables, Satellites, Rebuys, Bountys, Knockouts, DeepStacks’, and many, many more. Tough competition at mid and high stakes characterizes the games. Soft games are available at micro stakes. The marquee tourneys bring enormous player fields with a good percentage of recreational players which boost your chances of winning. However, at the high buy- in tourneys you may find a good number of pros at the table. Safe deposit methods accepted by PokerStars include Neteller, Paysafecard, Ukash, Skrill (Moneybookers), ClickandBuy, Webmoney, Entropay and InstaDebit. Players can also deposit money into their PokerStars.com account using local bank transfers, Visa cards, Mastercards and bank wire transfers. The PokerStars.net Download support staff is online 24 by 7 to answer player queries. A comprehensive FAQ section answers almost every question that a player can possibly ask. Players can also email their question or use the Support form onsite to relay their queries. The site takes customer service and feedback very seriously indeed and this ensures that the support staff respond to your queries in the shortest possible time. Some players have reported server issues when the site faces massive traffic especially on weekends and holidays. Slowdown is also a common complaint at these times. However, this site has demonstrated its commitments to player satisfaction time and time again and these problems are likely to be rectified quickly when they do occur. The incredible game variety, customization options and the reliable software more than make up for any shortfalls. Add to these the generous bonus and rewards programs and there is really no reason for you not to sign up here if poker is your game of choice.